Raumfahrt+Astronomie-Blog von CENAP - Blog: UFO-Forschung - Is there anything more? Wir schreiben das Jahr 2019 (aber es könnte auch 1957 sein) und die UFO-Forschung stellt die Ufologie nach wie vor ins Abseits. Gerade auch in Deutschland präsentieren "die sich selbstbezeichnenden drei Großen" (warum eigentlich Groß, wer braucht in der Forschung Hunderte von Mitläufern? Tatsächlich sind es nur Schein-Truppen und nur Einzelne -ohne Frage auch fähige Untersucher stemmen das "Große") dürftige Fälle welche als Hinweis für außerirdischen Besuch herhalten. Man versteckt seit geraumer Zeit die schönen Untertassen-Fälle in der Schublade aka Akten-Ordner und lässt sie ruhen auch wenn man längst eine Identifizierung vornehmen könnte, und versucht nun die UAP Variante als Flucht nach Vorne. Ist schon verrückt wie sich die Ufologen selbst auf den Arm nehmen, nur wenige der Akteure scheint bereit zu sein sich nicht weiter selbst etwas vor zu machen. 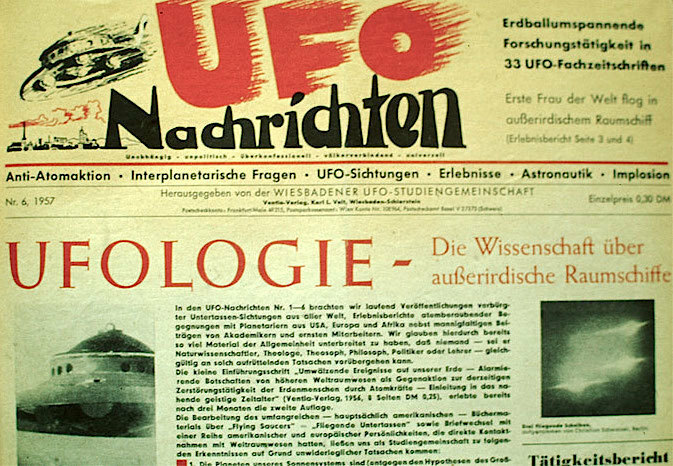 Wenn man Jahrzehnte allerdings den Kollegen und Lesern UFO-Träume verkauft, ist es schwierig aus der Ufologie-Sackgasse heraus zu kommen. Doch ist dies nicht allein in Deutschland zu beobachten, nein weltweit ist es eine eigene Welt in der die Ufologen leben und eigentlich nicht anders handeln, wie die Anhänger der Verschwörungs-Theorien von "Flach-Erde" und Chemtrail-Fanatikern. Memory is affected by retelling, and we rarely tell a story in a neutral fashion. By tailoring our sto- ries to our listeners, our bias distorts the very formation of memory—even without the introduc- tion of misinformation by a third party. Another year is about gone and we are no closer to the solution of the UFO “mystery” than we were at the beginning of the year. In fact, we can pretty much make that same statement for any year from the early 1950s to the present. It seems there will never be any solution other than the one that skeptics have been presenting since the dawn of the UFO era. I keep thinking back to the Phil Klass curse, where he proclaimed that UFOlogists will never learn anything more about UFOs than what they know now. UFO proponents have to keep asking themselves, “Is this all there is?” or “Is there anything more?” If they are honest with themselves, I don’t think they will like the answers to those questions. In order to justify the study of UFOs, many UFOlogists go back decades to find some peculiar event that they can champion as an event that defies earthly explanation. Some collect these types of cases like they were rare stamps or coins. It is their hobby. It is important to point out that mysteries abound throughout history and not all involve UFOs. Just because a case cannot be satisfac- torily explained does not mean that an explanation does not exist. It just means that there may not be enough data to resolve the event to everyone’s satisfaction. Other UFOlogists seem to feel that the statistics show something significant is happening. They tabulate all the reports they can find and conclude, “How could so many people be so wrong?” The problem with this approach is that they are raw reports. We have no idea of the quality of each report or how many can be explained. Individually, they have no value. If you multiply 0 by a billion, it is still zero. Even if one were to whittle down the number of cases to only those that defy explanation to that individual, some of them may have explanations that can be found by others or the quality of the reports may not be that good. UFO statistics may simply be a case of GIGO (Garbage in = Garbage out). Then there are those class of UFO proponents, who are waiting for “the case that skeptics will dread”. There have been many such cases over the years and the skeptics are still present being critical of the claims made by Ufologists and demonstrating that most, if not all, of such cases are not as convincing as claimed. Lastly, we have those who are hoping that some UFO organization will finally convince scientists around the world that UFOs are not bunk or will lift the veil of government secrecy that prevents the truth about UFOs from being revealed. The latest version of this kind of organization is the To The Stars Academy (TTSA), which hints they have collected earth shattering evidence. What they have presented lacks provenance and details. The TTSA is no different than any of their predecessors and will never present anything significant because there is nothing significant to present. That has been the UFOlogical standard for seventy years and the TTSA is not going to change it.